Primary Ciliary Dyskinesia (PCD) affects more than 25,000 people in the U.S. This might not surprise a lot of people but every day is a “bad hair day” for me. Yes, sometimes (okay, maybe often) my locks are frizzled and drab, but I’m actually referring to “hair” that does much more than keep our heads warm. In the battle between chicken and predator, it’s no surprise that the chicken usually loses. That’s why last summer I decided to add Guinea Hens to my little flock. Not that Guineas can pistol-whip a fox or shoot down red-tailed hawks. Their only virtue is the shrill sound they make when something in the barnyard is “just not right.” That could be a predator, but I’ve found that a rolling tumbleweed, a pop can or even the grass growing can prompt Lola, our Guinea Hen, to send out her high-pitched, ear piercing shrieks. Despite reports of her death, Hilda the One-Eyed Hen lives! She survived a vicious predator attack last summer, made it through winter, and persevered after a run-in with a car. My car. Hilda the One-Eyed Hen is one tough old bird. Last summer she was the only survivor after an attack by a predator. Her eye and a portion of her head was so swollen I didn’t think she’d make it, but she did! The swelling went down, but she lost vision in her eye as a result of the incident. I figured she wouldn’t last long, as a one-eyed chicken can’t see 50% of what might be coming for her. (Which unfortunately is why she seems to be preferred by the roosters.) But she made it through the cold winter, only to face death again. On Monday night I got in my car to go to the high school to pick up my son. I saw Hilda sitting on the edge of the driveway as I was pulling out, so I maneuvered around her. But then I heard a “clunk.” My daughter said, “Mom — you just ran over a chicken!” I said that no, I saw that hen and drove around her. It must have been a stick. But sticks don’t have feathers. And there were feathers all over the driveway. We got out and looked around. My daughter spotted Hilda underneath the shrubbery. I walked over to her and gently tried to get her to stand up, but she hobbled away with one of her legs dragging on the grass. It looked like her hip was broken. I felt terrible. In my 9 years of chicken ownership, I’ve never ran over one. They usually get out of the way, but I imagine Hilda got confused and ran under (instead of away from) the car. My husband came to see what was going on. Hilda was breathing slowly and we figured the end was near. She could barely hold her head up. He told us to go on and he’d take care of her, so we left for the high school in low spirits. Two months ago I got four new chicks. They’ve been doing great, but Hilda has had her eye on them. She pecks at them and I find them hovering in corners to escape her wrath. A few nights she wouldn’t even allow them inside the coop. So even though I felt sad that for her pending demise, the only bright side was that the little chicks wouldn’t miss the abusive pecking. I can just hear them cheering, “Hooray — that one-eyed monster is dead!” They are just too young to understand how Hilda’s brushes with death have made her a bit edgy. When we returned later that evening, I went to close up the coop and make sure all of the other birds were okay. To my surprise, there was Hilda snuggled up with the four little chicks. They looked up at me as if to say, “I know, right?” I picked up Hilda and checked her out. She seemed okay! I placed her inside a milk crate filled with straw to settle down for the night. Totally surprised at the turn of events, I pressed my husband for details. “She started walking around and seemed fine,” he said. In fact, she walked all the way from the shrubbery to the coop, a good 30 feet and then up the ramp. Amazing! When I posted Hilda’s story on Facebook, one of my friends said, “She must have a destiny to fulfill…” Maybe she’s right. Since she’s not filling a grave or someone’s stomach, maybe I could make a little patch for Hilda’s eye and she’ll enjoy fame and fortune as a chicken pirate. Or perhaps her story will make headlines and she’ll start demanding a new nesting box, green grapes and pasta every day. Whatever’s in her future, we’ll keep an eye out for her, because she’s only got one left. Frozen water everywhere — but not a drop to drink! It’s been an incredibly dry winter here in Minnesota, and the snow I depend on to water the chickens has been nonexistent. A large heated equine water bucket does the job every winter. I plug it in and place it inside the chicken pen. As the snow falls, it keeps a nice fresh water source for the chickens, cats, dogs and occasional predator. When there’s a big snowfall, I simply shovel snow into the bucket. This really saves time and energy as I don’t have to haul buckets of water from the pump, which is located about 200 feet away. And the chickens enjoy gathering ’round the water cooler to share the latest gossip and cluck about Civil War history. Unfortunately, this winter the flakes aren’t cutting it. So I get lazy and leave ice cream buckets and Cool Whip containers filled with tap water just inside the pen instead of filling up the heated bucket. The birds sip the water until they are satisfied, then it freezes. Frozen water is worthless to a yardbird. Last night I felt a burst of energy and decided to fill it to the rim so the chickens could easily reach the warmish water. I grabbed a few of the frozen containers and dumped the ice chunks into the empty bucket, and proceeded to march to and from the pump to fill it to the top. It was exhausting, but my birds are worth it! I dumped more water into the bucket, and saw that all of the water flowed straight through an ice-cream-bucket-edge-sized hole in the bottom. The chickens looked up at me sideways with precious, muddy water dripping from their beaks. Small rivulets of the stream flowed around their feet and out through the other side of the pen. Cackling commenced. I rounded up the birds and sent them into the coop to dry their feet before frostbite set in. I’d had enough of their dry, pathetic attempts at humor and wisecracks about my crack. I unplugged the bucket and through it in the trash. For 9 years the heated pail solved my watering problems during the winter months. Now that the bucket has kicked the bucket, I’ll have to figure out another efficient way to water my thirsty birds. Or perhaps a Providence Spring — with much needed precipitation — will finally come to Golden Farm? The new chicks are almost 2 weeks old and all is well! I’ve been keeping them in a tub inside our workshop, but yesterday when I saw the mom peering over the edge of it I couldn’t resist letting them out. It was a beautiful day and it seemed like a crime to leave them caged inside. Truett of course is such a proud papa (shh…don’t tell him he couldn’t possibly be the father). He stayed outside and watched them all afternoon as the chicks ate bugs, took dirt baths, and went rock-climbing with their mama. The hen dutifully brought them all in the coop at dusk so I was able to close it and everyone was tucked in safely for the night. At least one predator-free evening! Happiness = 5 new baby chicks! After a month of tremendous loss at Golden Hills Farm, I’m reminded that little surprises can bring hope at any time! Yesterday a hen and five chicks emerged from somewhere — a welcome sign that life goes on. For the past month we’ve been one step behind several predators. 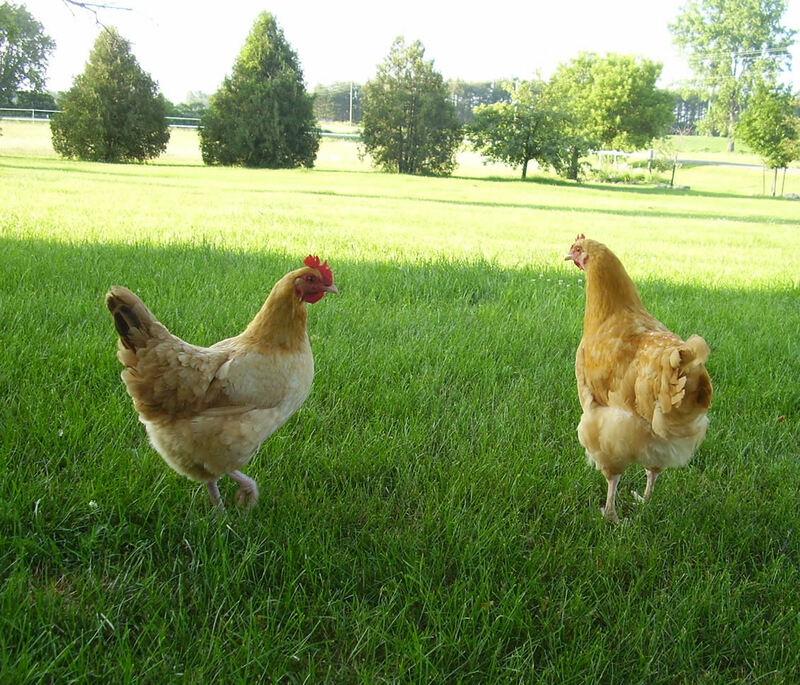 Remember those adorable new Spring Chickens? ALL of them are gone — thanks to some low-life member of the food chain. We know there have been hawks, but we also suspect a weasel has made a horrible impact on the flock. We’ve found at least three carcasses, and are missing about seven other chickens, including the adorable Spring Chicks and their mother. Needless to say, we’ve gone from getting between 6-9 eggs a day down to 2. Something has been eating the eggs, also, because I find eggshells near the coop. We found a small hole that went from inside the pen to just outside the fence, which made us suspect a weasel. Any thoughts, chicken friends? Truett, our Golden Retriever/White Shepherd now has some new babies to obsess over. He’s as worried as the Mother Hen when it comes to his little chicks — and so are we. That’s why last night I dropped a towel over the mom and babies and put them all in a safe, secure “nursery” inside our workshop where no hawks, weasels or other unwelcome creatures can get them. However, it would be a bummer if these were five little roosters, because they will for sure have a short life before they are key ingredients to chicken soup. A few nights ago I was lamenting the fact that I had no brooding hens, and thus no tiny chicks to bring into the house and cuddle. Yes, I know that sounds strange, but ever since I can remember I’ve loved baby chicks — they are soooooo cute! Back to my story. My husband and I were discussing how usually at this time of year I’m waiting for chicks to hatch, and that the delay may be due to our extended cold, wet, rainy winter weather. We had only around 3 nice days the entire month of April, not much incentive for a mom to bring vulnerable young into the world. No sooner had we complained about the hens when my husband spotted one sitting down in our granary. “That’s strange,” he said, “is she sitting on eggs right there?” As we approached the hen, she stood up — and six or so chicks scattered from beneath her. What a pleasant surprise! 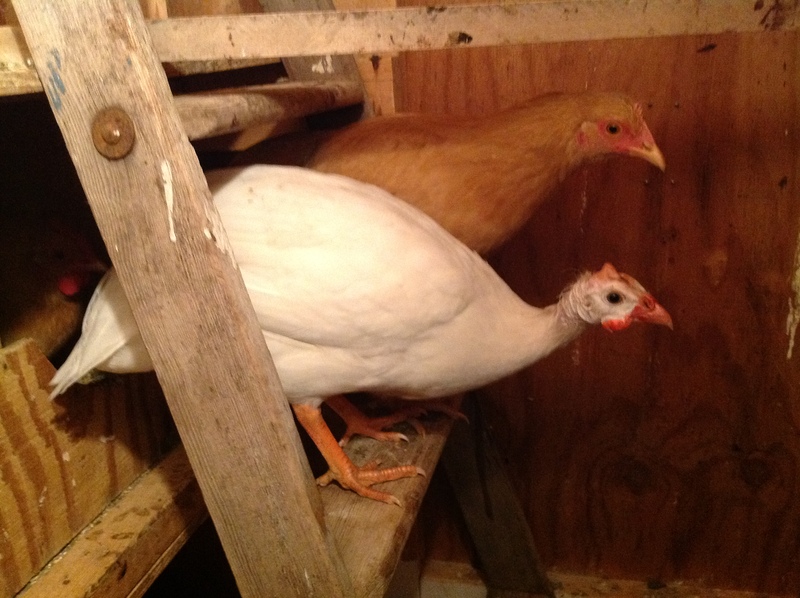 The sneaky mom hatched them inside a dugout hole in the flooring of the granary. The chicks appear to be a few days old. I am now calculating ways to hold one without being hen-pecked. But even if I have to endure her wrath, it’s worth it! See my hen and chicks on YouTube! Festus was a little white bantam rooster from my first batch of chickens. My children have fond memories of Festus chasing them around the yard and wreaking havoc on their lives. My son recalls getting off the bus, carefully looking around for the little white demon, and then running down the driveway only to be ambushed by the little fellow from his hideout in the shrubbery. On another occasion, my son’s friend was visiting and asked if he could go feed the horse. “Sure,” I said, welcoming the help. I watched him head out to the stable, but then I got busy doing inside chores. About 45 minutes later, I realized that he hadn’t come back in the house. He was outside, sitting in the back seat of my car. I approached the car door and glancing around, he rolled down the window. “What are you doing, Cody?” I asked. St. Patty’s Day feast – fit for a flock! When we got home, I carefully navigated the muddy slopes to the coop with their meal. A lovely plate of French fries, baked beans, BBQ beef, corn on the cob, cornbread muffins and cole slaw was presented to the flock, and they descended on the food immediately. I wished them all a Happy St. Patrick’s Day and closed the door. Walking out of the pen, my shoe became encased in a slough of mudpoo and was nearly sucked off my foot. I’ve got some cleanup work to do out there this weekend. It will be so nice when the birds can frolic about the yard again and spread their joy instead of concentrating it inside the pen and coop. Being eaten by another feathered fellow? So unfriendly and morbid. Especially when the consumption takes place in front of your family. I swear egg production goes down each time (well for sure by at least one egg every day).